Sometimes I sit down at my clay table with a specific goal in mind, but no idea really how I’m going to do it. Then I document each and every step of the design process to create what I call my Creative Maps – or how I get from here to there.. 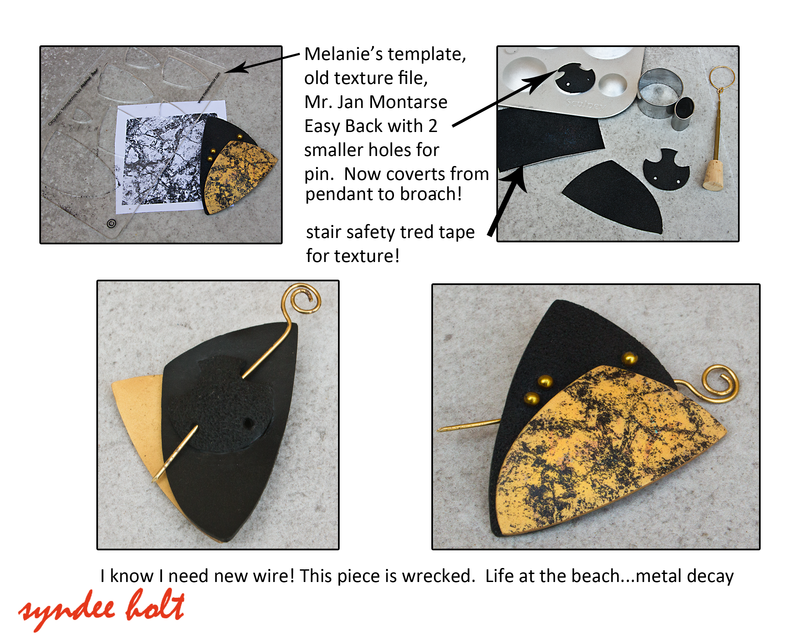 This time I wanted to see if I could adapt Mr. Jan Montarse’s Easy Back so it could be used not just for pendants, but for broaches as well. I had thought of and rejected at least 15 different ideas, but once I had a piece in hand, it was so obvious to me! So this Creative map is in 3 parts. First, the actual adaptation (the JanSyn back?) click the picture to make it bigger! I was consolidating some transfer art folders into one folder on my cloud and I came across some images I hadn’t played with yet. Perfect for my trials right? I also wanted to play with my new Melanie Muir template I got at ES2. This idea worked! the shape of the circle helps to lock the pin back into place. So now this piece can be worn either as a pendant (through the top holes) or a pin (using either one of the top holes and one of the smaller holes). My early prototypes (you will see later) only had one smaller hole, but since I couldn’t be bothered with deciding which way the pin would sit from the back, I put 2 holes. I found this old image of grasses and thought it would be perfect for another idea I had percolating. I had decided that my Sculpey New Color Tuesdays for August would be about the blues. 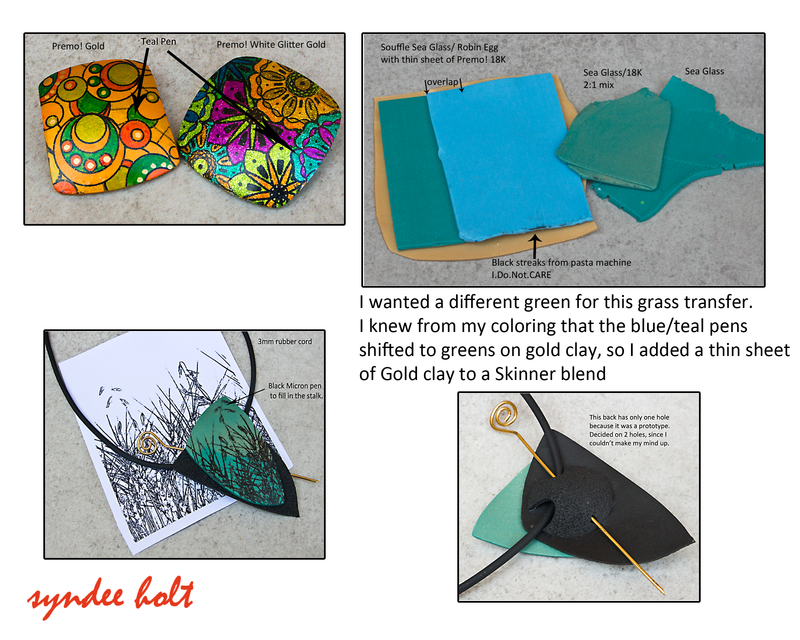 I don’t normally use blue clays, so it was time..
Now since I knew from my coloring that the blue/teal pens shift to lovely greens on gold clays, I decided to add a little bit of gold to this Skinner blend of Souffle Sea Glass and Robin Egg by adding a very thin layer of Premo! 18K Gold over the entire blend before starting it. This didn’t have to be a perfect Judith Skinner blend of the colors, so I just overlapped the two colors. It worked! My blues shifted to rich, warm teals! And you can see that this original prototype (with only one broach hole at the bottom) is sporting both the pendant cording and the pin- I may even wear the pendant with the pin in place since we don’t have much call for wearing clothing heavy enough to support a broach. The pendant pieces were baked on a large metal bowl to give just a gentle curve to them, while the back is baked on the smallest mound on the Sculpey Hollow Bead Maker that it will fit. But I wasn’t done! I did my NCT August Blues mixes and used the scraps from that as just marbled clay to create some more pendants. I even added some more oldie-but-goodie transfer patterns to the mix, this time experimenting with mixing the patterns and colors. And finally, I had a bolo tie mount that I had been thinking about, so I started the prototype for it as well. 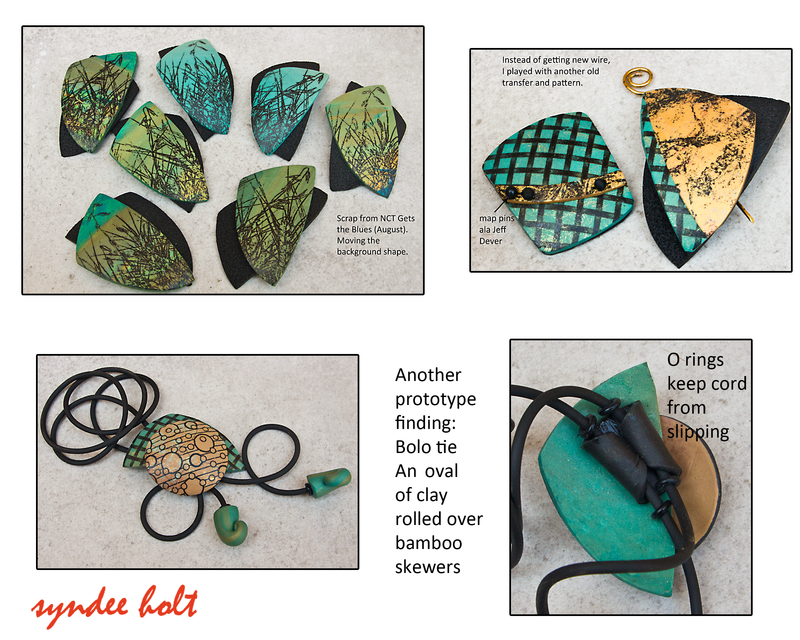 This entry was posted in Clay, New Color Tuesday and tagged clay retreat, color mixing, New Color Tuesday, photo transfers, Polyform, polymer clay, polymer clay jewelry, Premo, Premo! Sculpey, Sculpey Souffle. Bookmark the permalink.